PaleolithicMD “It Starts With Food” Book Giveaway! Ok everyone, time for an exciting giveaway! 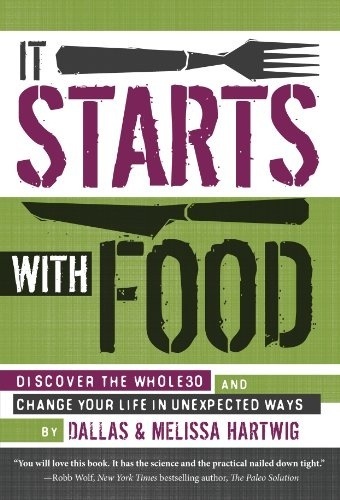 Weeks ago I pre-ordered my copy of Dallas and Mellisa Hartwig’s new book “It Starts With Food” from Amazon.com. I then began the patient wait for the release date to come. Much to my surprise when I got back from vacation I received an advance copy of the book from the Hartwig’s to read. I’m so grateful for their generosity and our growing relationship! That said, what to do with my pre-ordered book? Sure, I could cancel it because it has not shipped yet, but I figured why not give it away to a lucky reader as a giveaway! It’s a pretty simple giveaway and will include two items…It Starts With Food and a SURPRISE! 3) Enter one comment on this post telling me you have done both Please include your twitter handle on the post so I can contact you in case you win! IF you don’t have both types of accounts do what you can and I’ll still throw you in the mix! Come on, that’s pretty easy isn’t it! I will take entries until Friday June 15th and will randomly select a winner. I’ll contact the winner via twitter and ship out the book and surprise pronto! Good luck everyone out there, you don’t want to miss out on your opportunity to read this amazing book for free! I don’t have a Facebook account and never will. It’s okay that I don’t qualify for your contest, though. I enjoy your blog and Twitter posts. Thank you for your efforts. I’ll give you a break…just this once. Consider yourself entered and thanks for the kind words! Done & done!! @heiltsuk_runner on Twitter. Hi – I am following both. Keep up the good work! Already follow-up on Twitter, just “liked you” on Facebook. Trying to work up to a 30 day challenge. I don’t have a twitter account but I do follow your posts on Facebook, get your update emails and read your posts daily! Love following your journey as we are making our way in the same journey! Great stuff happening here. So glad you’re getting Alexandrianon the Paleo map! Whole30 August 1st?!! Just found your blog and enjoy it a lot! No twitter, though. I follow on facebook but do not have twitter. Thanks! Like on Facebook and follow on Twitter, as well as RT. @goofycancook AWESOME give away! Liked your Facebook, following you on Twitter @fireflyroad, and retweeted! Thanks! Liked you on FB, following you on Twitter, and retweeted from @granolarn. Already follow you on Twitter, now I like you on FB too! I retweeted from @NEKLocalvore. I would love to have that book 🙂 love your stuff, keep up the good work! RT’ed your giveaway, not on FB, love seeing Paleo MD’s sharing the word! Thank you. I dont have a facebook, but my twitter is @toreyfreeman thanks for hosting the contest! I did it! 🙂 and I started the whole30 after reading ur blog! I had only been eating paleo for a week but wanted to amp it up. Loving it so far! Likewise no FB account but @paleonewswire RT ‘ed this post and following you “on the Tweeter” as Gov. Perry likes to say. Happy trails from Texas! Hello Doc. I am following and am entering your contest. Thanks so much @familosity . Following and retweeted. @hopalong15. Liked on FB. Tan Ya. Did it and I hope I win it! Just started following your blog and love it! Thanks! I just found your blog on Freshly Pressed. Love it! I like and posted on your FB page and I retweeted the giveaway. Please enter me for the drawing. Done on FB and already follow you on Twitter, RT’d the contest. @fitnesskelly Need some reading for an upcoming July vacation! I have done both! 🙂 Would love to have the book! I’ve done both and would love to have a copy of the book. I really enjoy your blog. Just liked you on Facebook, and already follow on twitter. @rogue_dietitian Please pick me! I’m just starting my private practice and could really use the resource. Done and done. @alicejanice on twitter. This book is just what I need. thirty-five weeks pregnant and need to get my health and my family’s in check. I’ve liked you on Facebook for a while. I’ve heard so many good things about this book, I’d love to win a copy! Thanks for the great blog you provide! Liked and followed. Twitter is @sonofakarma. I liked you through Accesa Labs. My crossfit gym posted about your site (www.crossfitintrepid.com). I am a data junkie that is involved in health care. http://www.crossfitintrepid.com/2011/02/16/the-data-junkie-blood-work/ I have done the whole 30 twice and got tested before and after. Oh! And you’ve been retweeted!